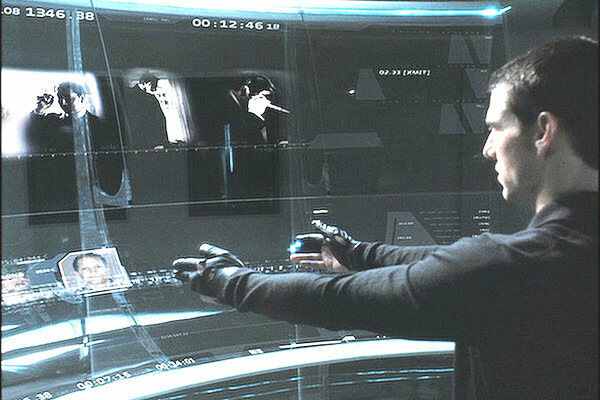 Minority Report is centered around a system in the future that can prevent murders from happening. At first glance, that sounds pretty great and has worked so well that not a single murder has occurred in the last six years. As we are able to see deeper into the “precrime” unit, there are faults, a tangled web of deception and a sense of morality being lost. Chief John Anderton (Tom Cruise) runs the precrime unit like a preventative detective of the future. Thin glass screens display images like details from a dream that come directly from the minds of the three PreCogs, gifted young people in a suspended state of half consciousness that can see murders before they happen. Anderton and his team decipher the images and names the PreCogs produce to swoop in and stop murders in time. They arrest the future murderers before they have technically done anything and send them into a suspended numbed state in an efficient jail. Tensions are built when Danny Witwer (Colin Farrell) investigates the precrime unit, looking for flaws. Anderton upholds the unit, his personal history involving a murdered son sealing his alliance. But when he discovers that the PreCogs have named him as a future murderer, Anderton becomes a fugitive. With knowledge of his future, he can choose whether to follow his predestined outcome or not. With his ability to choose, and new knowledge he finds about the PreCogs along the way, he could bring down the whole system. What makes Minority Report work like a well oiled machine, is the mix of engaging plot, a detailed futuristic setting and use of repetitive images. Many times, it feels like Spielberg took the basic ideas that make Blade Runner and Vertigo so distinctly memorable and used them both at times here. In Blade Runner, there is a focus on the futuristic world, with many details contributing to its atmosphere. The same treatment is used here, in a very different future world. Light is always very bright and unnatural, eye scanners identify you at every turn and then advertisements are personalized, calling you out by name as you pass by. Themes from Vertigo are played up by use of repetitive image to create an uneasy recognition. These images start piecing together, bringing us closer to a future murder and suspense is created beautifully. There is also a great Hitchcock reference in a car assembly line scene, a scene all Hitchcock’s idea, but one he never got to make. Even though Minority Report has made me look back to other films, it stands on its own perfectly. There is plenty of action, all played out in very smart and engaging ways. 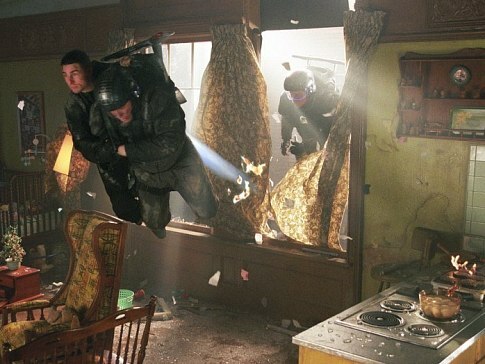 While Anderton jumping from one vehicle to another is thrilling, the jetpack scene has some comical elements. The photography is very grainy and has a dirty feeling, yet washed with bright light that contributes to that futuristic look. I loved Max von Sydow’s character and performance, the little time he has on screen goes a long way. Best of all, the story had me engaged and guessing to the end. I highly recommend Minority Report. When you see Extremely Loud & Incredibly Close, I think there are a few things you need to remember and keep an open mind about. One, the film is mostly told from a unique child’s perspective. So when his inner monologue feels a bit cliche or dramatically out of touch, remember how you thought as a child. Not all of our ideas were made of gold, but we didn’t know that yet. Go easy on him. Two, yes, this film is about the attacks on September 11th, like America cannot get enough of its own tragedy. Though the film remembers the past (and who could blame this kid for it? ), the story is really about moving on from any tragedy. The scars of September 11th are too much for one film to heal. And three, this kid has amazing parents, both of them. Oskar Shell (Thomas Horn) was about nine years old on September 11th. He and his father (Tom Hanks) were very close and has always encouraged Oskar’s curiosity. He asks so many questions, many parents would have given him the terrible answer, “Just because,” years ago, but thankfully not his father. They play elaborate mind games where Oskar searches for artifacts all over Central Park. These games of critical thinking have made Oskar very organized and independent for a boy his age. I believe he is a gifted child, but also suffers from anxiety and social issues, possibly Asperger’s syndrome. After that day, Oskar is without his father, his teacher and playmate, and is faced with something he cannot comprehend: chaos. He is too logical to understand why this happened and it hurts to see this boy grasping at nothing, hoping he can find answers. And his mother (Sandra Bullock) is doing all she can for him, more than he knows. What Oskar does find is a key. He believes, somehow, that finding what it unlocks will help bring him some last connection and closure with his father. 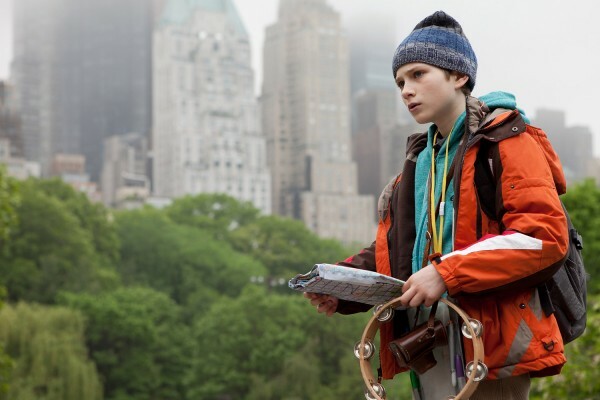 The elaborate system Oskar sets up to search all over New York is impressive and his determination should be encouraged. Along his journey to find where the key fits, Oskar meets a wide variety of people. Most of them are helpful and welcoming. As he meets them, in his unique socially awkward fashion, Oskar takes their photograph and catalogs them in his journal. While he is focused on the key, the boy does not realize how his journey is touching so many people in a beautiful way. But that’s just how kids are, right? Too easily they can focus on one tangible idea and gloss over the big picture in front of them. I’m sure we can all remember a moment like that from our childhood. 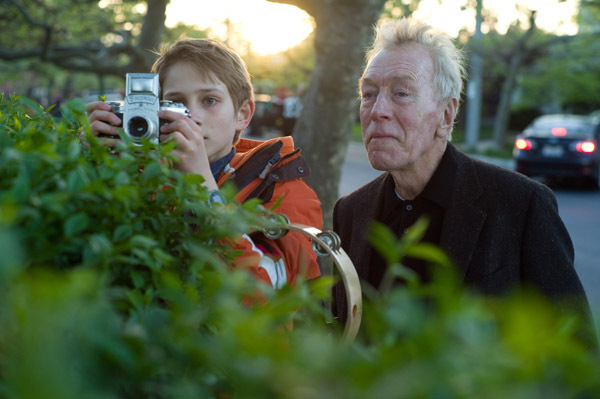 One important person Oskar meets is The Renter (Max von Sydow), who rents a room from his grandmother (Zoe Caldwell). He does not talk (whether he can or not is a mystery) and offers to help Oskar on his quest. I love how he keeps his communication simple, with a thick pen and pad of paper and tattoos on his palms for ‘yes’ and ‘no’. I think that sort of simple logic draws Oskar to him. Without saying a word, The Renter reveals levels of intrigue and guilt, that adults will connect far before Oskar does. This film seems oddly slipped into the Best Picture nominations, I certainly did not expect it. It only has one other nomination, Max von Sydow for Best Supporting Actor, and to hear his name called in 2012 feels out of place. I do not find the technical aspects of the film great. Adults will connect a few plot points before they come to fruition, but I feel compelled to overlook that since this is a child’s journey and mostly his perspective. What I believe earned this film that last slot is something emotionally poignant and intangible. Since I saw it on Friday, I find myself thinking back to it often. I have reanalyzed moments unintentionally throughout the day. There are small, telling moments that haunt me a bit. Perhaps the way this film is hard to shake is what put it in the Best Picture category. I do believe this film is good, very good, but not great. It is too easy to mistake this to be a film simply about September 11th. It’s about moving on from it and should serve as hope to anyone after experiencing unspeakable tragedy. If the Academy is looking to award a film that uses one tragic story to better understand a different kind of grieving that people can experience, Extremely Loud & Incredibly Close will win the Oscar for Best Picture. 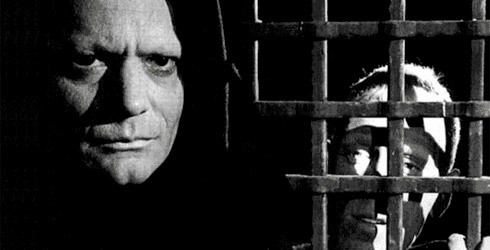 In Ingmar Bergman’s The Seventh Seal, Death (Bengt Ekerot) is a figure in a hooded black cloak and a pale, stern face. He has been very busy lately, following a crusading knight on his way home to his castle and dealing out the black plague far throughout the land. 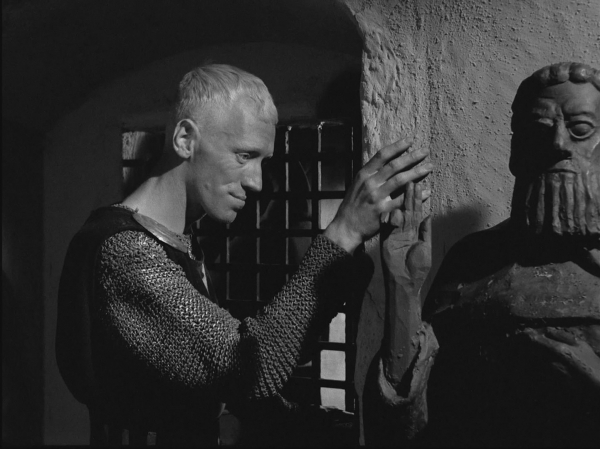 When he finally comes for the knight, Antonius Block (Max von Sydow), the knight strikes a deal. They will play chess for his life. The image of the knight, his hair lighter than his own skin, matching wits against Death is beautiful and iconic. Through endless parodies, this image still holds its own ground in the film, and strikes quite a chord. How arrogant do you have to be to think you can outsmart Death? Aren’t we all destined to lose in the end? No doubt that these questions are going through the knight’s mind. For years he has been crusading and killing in the name of God, but now he questions if God even exists. His thoughts, fears and worries on the uncertainty that will come with death become a heavy burden for him. His bleak outlook matches the setting. The plague is spreading through multiple coasts and rumors talk of the Apocalypse approaching. Tales of people dying from the Black Death are terrifying and sending people into a frenzy to repent, whipping themselves in penance and even cleansing themselves with fire. At one point we are shown a macabre parade of monks, the diseased and repenting people shrieking, moaning, carrying crosses and spreading a cloud of incense. It’s a very eerie moment, showing just a taste of what fear of death and damnation can cause. 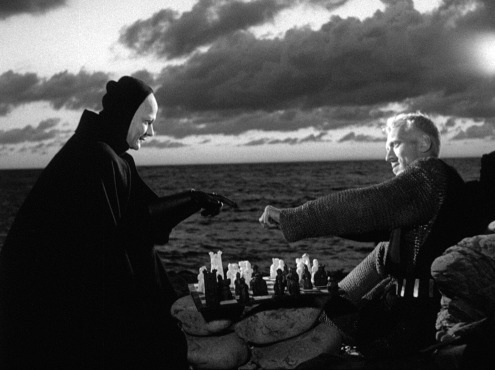 As the knight and his squire travel, playing a few moves of chess with Death as they go, they meet a group of actors. They seem to be too cheerful, as if not getting the memo on the tough times around them. Among them is a young family, Jof (Nils Poppe), Mia (Bibi Andersson) and their baby boy. Their presence is a breath of fresh air in a world where plague riddled corpses are the norm. As the threat of plague grows stronger, the knight offers to let them tag along on their journey to his castle. But is the knight playing right into Death’s trap and about to bring his innocent friends down with him? You see, Death has a few tricks up that dark cloak. In one scene, the knight and his squire happen upon a church. When the knight thinks he has found a priest to confess to, he starts spilling all his fears, his loss of faith and even his chess strategy. The moment the knight realizes he has just told all this to Death, we feel a rage and sorrow for the man. He is only human, and his squire (Gunnar Björnstrand) does not care to listen to his woes. He is far too much of a realist. This moment, as well as many others, really help us question the existence of God as well. Not only does he seem completely absent, letting the world become ravaged by the plague, but he lets Death pull dirty tricks. We understand the knight’s plight. 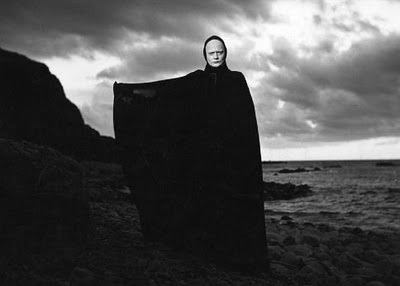 Ingmar Bergman holds The Seventh Seal as one of the best of his films, and he is a very harsh critic on himself. That alone makes The Seventh Seal worthy of my Oscar Snubbed status, but I have a feeling Bergman’s work was not quite on the Academy’s radar yet. His only Best Picture nomination was Cries and Whispers in 1973. In the introduction before the film, Bergman says that he made the film to help cope and explore his own fears on death. What he has created here is a striking and thoughtful contemplation on mortality that every film enthusiast must see at some point. However, a casual film fan will probably not enjoy this black and white Swedish film. It feels very archaic, like we are completely displaced from our modern society and dropped into the dark days of plagued Europe. That alone makes it a very beautiful film, but extremely eerie. 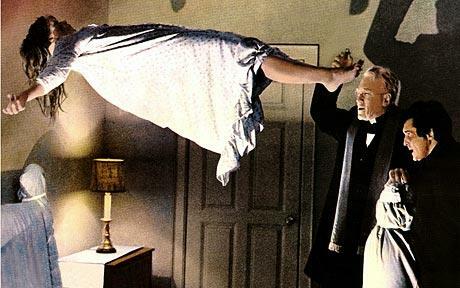 I love the story my mom tells about the first time she encountered The Exorcist. She went to see it at a drive-in with a few friends. My mom is not a scary movie person. Not at all. So she was terrified the entire time, cowering in the back seat, but around her, her friends were cracking jokes and laughing the entire time. She said, “I don’t know how they could find any of that funny, I thought it was horrifying.” My guess was that they were at least a little scared, but making jokes is a good way to fight back and keep cool. The sixties up to the mid seventies was where I believe horror films hit their prime. Argue all you want, but that’s where I stand. A keystone in there is The Exorcist, bringing a new kind or horror that few had ever heard of. Demonic possession is one of those satanic things that only the Catholics really believe in, and even they try to sweep it under the rug, like an embarrassment. The only other place you could culturally find this idea before the film was in a few primitive cultures. Of course, once The Exorcist hit theaters, people had a new fear to add to the list. Right next to zombies. In the film, Chris MacNiel (Ellen Burstyn) is a movie star filming in D.C. and her twelve year old daughter, Regan (Linda Blair) starts acting very odd. It’s not full blown demonic voices, heads turning backward spewing pea soup at first, it starts slow. So Chris takes her to the doctor, where they perform tests after test and come up with nothing, which leaves two options: she’s crazy or possessed. That second one doesn’t come up for a while, doctors usually try to avoid that path as long as possible. While all that is going on, Father Karras (Jason Miller) is having some faith issues. He’s an ex boxer with his frail mother is in a psych ward and lately the church just isn’t answering his prayers. He’s also a psychiatrist, and is sought out by Chris for both his vocations. After a few very creepy encounters with possessed Regan, he decides an exorcism is needed. But he’s not experienced enough to perform it, in fact there’s a whole song and dance that needs to go through the Catholic church before one can be performed. Thankfully, Father Merrin (Max von Sydow) has just returned from Iraq. He’s handled an exorcism before, we hear that it nearly killed him. Today, demonic possession movies are popping up faster than you can find a pair of priests, but they’re nowhere near the caliber of The Exorcist. They’re all about the demonic parts and over explaining the Catholic rituals. They start to feel more like really creepy documentaries rather than horror films. The Exorcist feels mysterious for a good portion of the film and it’s only in the last quarter that the exorcism is performed, really bringing the green goo to the fan. 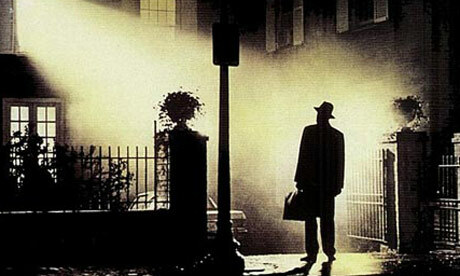 So, with all these cookie-cutter exorcism movies today would your average person still enjoy The Exorcist? I really hope so, but I know some will just laugh. In the right light, hearing Regan’s demonic voice saying all those horrible things is laughable. And that green slime can add some twisted comedy value. But The Exorcist has a solid plot, engaging characters and is just overall better film making than today’s demon flicks. Have yourself an exorcism marathon and you’ll have to agree, that is, if you can handle it.